People die, but all of them off screen and all of them most likely very peacefully. Except for Maggie's drug addict, money stealing, garbage ex-boyfriend, who falls into a small pond and drowns. At some point Maggie decides she's going to expose the doctor and starts taking files and messing with medicine to try and throw his 'treatment' into disarray. He tries to stop her but you see she switched the labels on the sedatives and he gave her saline instead of the sleepy juice so she was able to get away and-- dear god this movie was awful. At no point are you given a reason why the doctor is frying people's brains. I guess he was just bored? It's never proven to cure anyone but somehow he's managed to kill dozens of people already. Everyone else that works there is either in on it, infatuated with the doctor for reasons that the movie doesn't care to explain to us, or just don't care. It takes an attempted murder to bring this stuff into the light and even then the doctor is merely discredited. Despite having no effectively placed stakes or good characters or anything to keep your attention, this movie continues to meander about endlessly. 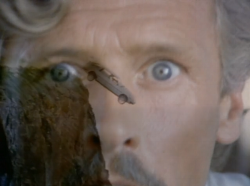 Only after 80 some odd minutes are you treated to an amazing shot of the abusive doctor commiting suicide by letting his car drift off of a cliff. The camera zooms in on his face, suddenly shocked as if he had not contemplated this moment for days, maybe weeks, and the afterimage of his horrified expression sticks around as the car falls onto the rocks below in slow motion. It explodes and burns for about 30 seconds and then it fades to black. Don't watch this movie. Watch that last little bit though. Brilliant.